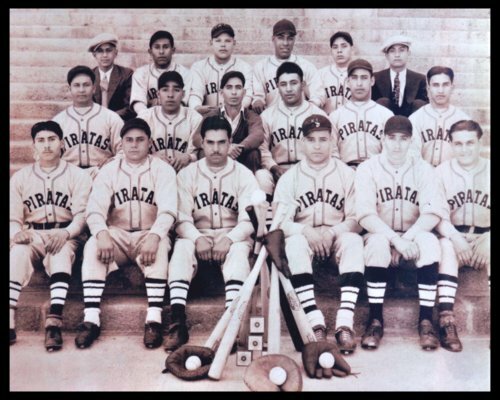 This is a photograph of the Piratas, a Mexican-American baseball team in Topeka, Kansas. People in the photograph are first row (left to right): Jerome Serna, Roy Tinoco, Cruz Duran, Louis Alejos, John Gomez, Manuel Cruz; second row: Antonio Gutierrez Tinoco, Perfecto Torrez, Espiridion Ramirez, John Perez, John Torrez, Pilar Soza; third row: Felimon Gutierrez (Tinoco), Lawrence Serna, Hilario Hernandez, Sebastian Adams, Frank Munoz, and Jesus Rodriguez. The team played at City and Ripley Parks. Digital reproduction of the photograph was accomplished through a joint project sponsored by the Kansas Historical Society and the Shawnee County Baseball Hall of Fame.